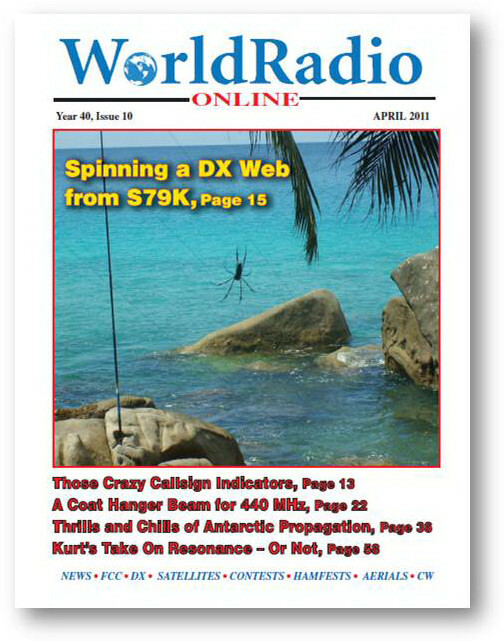 While you're waiting for your April issue of CQ or Popular Communications to arrive in your mailbox, enjoy a preview of each issue on their respective websites, <http://www.cq-amateur-radio.com> and <http://www.popular-communications.com>. CQs April highlights include a rundown of every article in the issue, as well as a link to a YouTube video demonstrating how to program the Kenwood TH-D72A handheld for APRS use. The issue includes a "First Look" at this new APRS-ready HT, as well as a short essay by APRS developer Bob Bruninga, WB4APR, on the many potential uses for the system beyond location tracking. We also have the full results of the 2010 CQ WPX CW Contest on the website, along with the expanded results for both the CW and SSB portions of the contest. 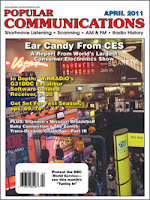 The April issue of Pop 'Comm highlights all the great new goodies on display at the Consumer Electronics Show, plus an in-depth look at WINRADIO's new G31DDC Excalibur software-defined receiver. Something you'll find on the website - but not in the magazine - is a direct link to a demo of this new no-dials radio. Both magazines should be in subscribers' mailboxes and on newsstands by the first week in April. New Rules regarding amateur radio Spread-Spectrum communications will take effect April 29, by which time one question in the Extra Class exam pool will need to be removed. The National Council of Volunteer Examiner Coordinators (NCVEC) has advised all VECs and volunteer examiners who design their own tests to drop question number E1F13 from the Amateur Extra Class question pool. The question deals with the maximum power permitted on amateur radio Spread-Spectrum transmissions, and the FCC has just changed the answer! Earlier this month, the FCC finally ruled on a petition filed five years ago by the ARRL, agreeing to drop the requirement for automatic power control on Spread Spectrum transmissions, but also dropping the maximum permitted S/S output power from 100 to 10 watts PEP. The new rule was published in the Federal Register on March 30, meaning that it takes effect 30 days later, on April 29. At that point, the answer to the exam question above will no longer be correct. Ham radio manufacturers donated hundreds of VHF/UHF handhelds to the Japan Amateur Radio League for use by amateurs at refugee centers and disaster relief centers, according to International Amateur Radio Union Region 3 Secretary Ken Yamamoto, JA1CJP. Ham radio disaster communications activity is ramping up in Japan, a week and a half after the country was hit by a devastating earthquake, tsunami and still-developing nuclear crisis. Most ham operations are on UHF, as well as 7.030 MHz SSB. For more detailed coverage of the ham radio response to the disaster in Japan, see our individual stories elsewhere on this page a special report in the May issue of CQ. Meanwhile, ham radio disaster relief operations in New Zealand were reported to be winding down as commercial services came back online in and around Christchurch, which was hit by an earthquake on February 22. Details on the ham response there are in the Public Service column in the May issue of CQ. The Dayton Amateur Radio Association has named the winners of its prestigious Hamvention® awards for 2011. Shirley Roberts, N8LX, of Dayton, was named Amateur of the Year (see our profile of Shirley in the May issue of CQ); Roy Lewallen, W7EL, will receive the Technical Excellence Award for his development of EZNEC antenna modeling software; the Special Achievement Award goes to Fred Lloyd, AA7BQ, founder of QRZ.com, and the Albemarle Amateur Radio Club of Charlottesville, Virginia, was named Club of the Year. The awards will be formally presented at the Dayton Hamvention® in May. Many hams from the US and Europe visiting Russia should find it easier to operate there, as the Russian Federation has decided to join the CEPT (Council of European Post and Telecommunications administrations) agreement on amateur radio licensing. No effective date has been announced. According to a posting on the Southgate Amateur Radio Club's news page, officials of IARU Region 1 consider the decision "a major step forward to achieve worldwide radio amateur roaming." American hams holding Extra or Advanced Class licenses may operate in CEPT countries without special permission. General Class licensees have restricted privileges. Novices and Technicians have none. For information on operating by US hams in CEPT countries, visit <www.arrl.org/cept>. In other DX news, Southgate also reports that the new government of Southern Sudan has issued its first amateur license, for a DXpedition scheduled for July. 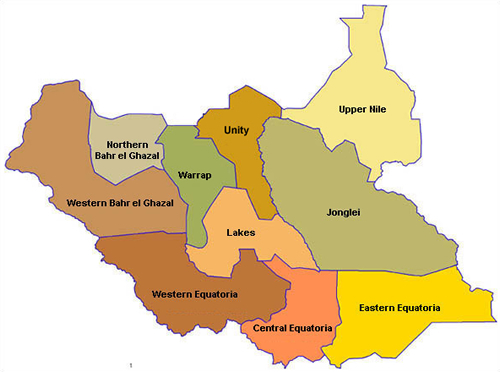 No callsign has yet been issued, as the International Telecommunications Union has yet to assign a prefix for Southern Sudan. Also, The Daily DX reports that the planned DX0DX expedition to the Spratly Islands has been postponed again, this time until next April. Team leader VK3FY said the delay was due to circumstances beyond their control and was "in the best interests of the team of operators." Thirteen alleged pirates from Somalia and one from Yemen have been indicted by a federal grand jury in Virginia on piracy, kidnapping and firearms charges. They were captured at sea by the U.S. Navy after allegedly taking over a sailing vessel off the coast of Africa and killing the four crew members on board, three of whom were hams. According to Newsline, the four had been delivering Bibles around the world. The suspected pirates will stand trial in Norfolk, Virginia. AMSAT reports that a ham radio contact between astronaut Cady Coleman, KC5ZTH, aboard the International Space Station and students from several schools in Poland marked the 600th school contact for the Amateur Radio on the International Space Station (ARISS) program. The contact took place on March 17. In other space and satellite news, AMSAT also reports that the ARISSAT-1 satellite - now on board the ISS awaiting a July launch - was scheduled to be turned on from inside the station on April 12, as part of the celebration of the 50th anniversary of the first manned space flight, by Russian cosmonaut Yuri Gagarin, in 1961. Two new ham satellites -- FASTRAC-1 and FASTRAC-2 - successfully separated from each other on March 15 (they'd been launched as a single nanosatellite last November, according to the ARRL), and hams were invited to help track them. FASTRAC is a project of the University of Texas. For more info, see <http://fastrac.ae.utexas.edu/for_radio_operators/overview.php>. Bad news for three other ham satellites -- Explorer-1, KySat-1 and Hermes all were lost in a launch failure. According to Southgate News, the three satellites were on board an Orbital Sciences Taurus XL rocket, which failed to reach orbit after a March 4 launch. 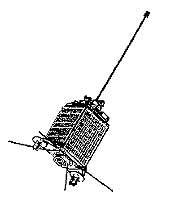 Drawing of the UO-11 satellite. The OSCAR-11 satellite turned 27 years old on March 1. According to the AMSAT News Service, the satellite was designed, built and launched - using only commercially available off-the-shelf components - in just six months. The satellite was one of the first amateur satellites built at the University of Surrey in England, under the mentorship of Professor Sir Martin Sweeting, G3YJO. From one of the oldest amateur satellites still functioning to one that's just on the drawing board, we switch to news of AMSAT's Project Fox. This is the next project for the satellite group, now that ARISSAT-1 is safely aboard the International Space Station and waiting for launch. AMSAT Fox will be a tiny (1U) cubesat packed with features. The AMSAT News Service says plans call for it to carry a UHF/VHF FM transponder - a first for such a small satellite - that can be worked with a handheld radio and small antenna. One goal is to be able to include the technology in university-built research satellites to permit them to function as amateur satellites once their primary missions are concluded. For more information, see <www.amsat.org/amsat-new/fox/>. AMSAT-China has put together a DXpedition to southwestern China for experiments in EME (Earth-Moon-Earth) and satellite communications. Station BJ8TA is operating between March 20 and 23. According to the AMSAT News Service, this is the first-ever EME operation from grid field NL. The group planned to be active on all available satellites as well, plus 6 meters. The team was then scheduled to move to the Yunnan Astronomical Observatory (in grid OL14) for operations between March 28 and April 1. They were planning to use observatory's 11-meter radio-telescope antenna for EME operations. 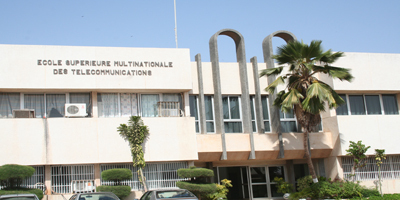 A ham station operating on HF and VHF has been set up at an international telecommunications institute in Dakar, Senegal, and a training module on amateur radio has been added to the programs offered there. According to Southgate News, the station, sponsored by IARU Region 1's "Support to the Amateur Radio Service" or STARS program, opened recently at Ecole Supérieure Multinationale des Télécommunication, or EMST, which has been designated as the first ITU Centre of Excellence. The facility is used to train future telecom engineers and regulators from 14 African countries. Responding to a petition filed several years ago by the ARRL, the FCC in March issued new rules for using spread spectrum in the amateur bands. According to Newsline, the Report and Order eliminates the requirement for automatic power control to keep transmitted power to the minimum necessary to maintain a communications link. At the same time, however, the order reduced the maximum power output allowed for an amateur spread spectrum transmitter from 100 watts to 10 watts PEP. 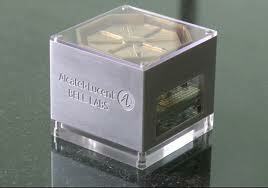 The lightRadio (TM) cube developed by Bell Labs. A team of researchers at Alcatel-Lucent's Bell Labs has designed and built a cell-site in a two-inch cube, a development that could revolutionize the way cellphone calls and data are routed. According to a Bell Labs news release and news reports, the lightRadio™ cube consists of three stacked circuit boards - one each for the antenna, the radio and the network connection - and it would not have to sit on top of a tall tower. It is estimated that wide-scale deployment of these devices could increase network capacity by up to 30 percent and reduce or eliminate the need for controversial cell towers. Connection to ham radio? The possibility for adaptation to the amateur repeater network and the potential for changes in some restrictive antenna ordinances, many of which were enacted in response to the building of cell site towers. Hams in Ontario are reporting that they are getting considerable HF interference from plasma screen televisions, and have asked the Radio Amateurs of Canada (RAC) for help. Southgate News reports that RAC has asked its members who own plasma TVs to gather data and report on their own interference problems as well as possible solutions. Specific makes and model numbers are requested along with descriptions of the HF ham station, antenna and exact nature of the interference. RAC would also like to hear from hams who have plasma TVs but do not experience interference problems. Reports should go to Norm Rashleigh, VE3LC, RAC VP/Industrial Liaison, at <ve3lc@rac.ca>. A group of "makers" in Louisville, Kentucky, mentored by some ham radio ballooning experts, is planning to attempt a transatlantic weather balloon flight as soon as conditions are favorable. Newsline reports that the LVL-1 Makerspace group got advice from high-altitude amateur radio ballooning guru (and CQ VHF columnist) Bill Brown, WB8ELK, Carl Lyster, WA4ADG, electronics designer for the Spirit of Knoxville. When launched, the balloon will transmit RTTY and the DominoEX digital mode on 7.102 MHz. You can sign up for launch notification announcements by following the instructions at <http://whitestarballoon.org>. There is reportedly a group of graduate students at Cornell University that also plans to try a transatlantic balloon flight. It will be fun to see who gets there first! Ham radio operators living in a retirement community in Tavares, Florida, have started a "Neighborhood Ham Watch" program with the blessings of the community's homeowners' association. Members of the Royal Harbor Amateur Radio Club set up the program to keep the 750-home gated community in contact with the Lake County Emergency Operations Center, nearby emergency management agencies and other hams in the event of a hurricane or other emergency that causes a loss of power and/or phone service. According to club Public Information Officer Ted Luebbers, K1AYZ, Royal Harbor's homeowners' association has made the Neighborhood Ham Watch program part of its overall disaster plan and authorized periodic setup and operation of the station to ensure readiness. Welcome page of the Sub9kHz amateur radio website. A new website allows greater sharing of information among hams interested in VLF (Very Low Frequency) communication, in this case, below 9 kHz. 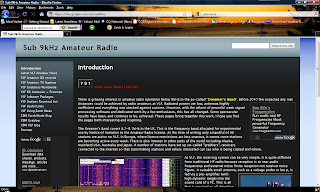 Southgate News reports that Roger Lapthorn, G3XBM, has launched a new site called "Sub 9kHz Amateur Radio" at <https://sites.google.com/site/sub9khz/>. The site will include distance records, information on earth-mode communications (through the ground! ), transmit setups and a kit to receive signals on this very long wavelength band. Is there hope for better band conditions? You decide! Check out this stunning view of an active sunspot region and its magnetic field loops ... March 21, 2011 (combined 171 and 304 Angstrom wavelengths) - via YouTube. Skydiving radio amateurs will jump from 14,000 feet and once they have deployed their parachutes will make contacts with as many ground-bound hams as possible on March 26 over Byron, CA. The dropzone (DZ) will be at Byron Airport where radio-jumpers have had "great success in the past," according to a posting on the Southgate Amateur Radio Club website. It's their seventh mission. A Net Control will be set up on Mount Diablo to assist with the event. Time: Parachute Control will be setup at the DZ at approximately 1100 hrs. Jump Times: The first jump is scheduled for approximately 1200 hrs and approximately each hour thereafter. We don’t have control over the aircraft so times may change. Listen for updates. We hope to make at least 4 jumps. “Jumper 1” Mark Meltzer, AF6IM, and “Jumper 2” Michael Gregg, KF6WRW, will be fitted with APRS gear that will transmit location and altitude as well as physio data which includes SpO2 (blood oxygen saturation) and heart rate. Click here to look for them at jump time, or on or your favorite APRS web site. QSTs and updates will be made on the W6CX Repeater (Mount Diablo), 147.060+, 100Hz. If you know of other repeaters that can be used to make announcements and can be reached from Mount Diablo, let the team know. Event specific QSL cards will be available. Join the action, make a QSO! For more information contact Rob at < KC6TYD@arrl.net >. Roscosmos, the Russian Federal Space Agency, says the ISS was reboosted 3.7 km. The readjustment, which took place March 18, was necessary to ensure the best conditions to dock Russia's Soyuz TMA-21 piloted spacecraft and the U.S. Endeavor space shuttle. Russia's Soyuz TMA-21 is expected to travel to the ISS sometime in early April, while the U.S. Endeavor will blast off from Cape Canaveral on April 19. According to the Roscosmos press release the maneuver was conducted using the two main engines on board the European Space Agency's Automated Transfer Vehicle (ATV-2), named after Johannes Kepler. Since the orbital period changes roughly 1.2 seconds for each 1 km of altitude, observers on the ground should see almost 5 seconds of change. The usual caveats about tracking program ISS discrepancies should be kept in mind until the Keplerian Elements catch up. Click here to see the Roscosmos press release. Australian Broadcasting Co. (ABC) News has posted dramatic before-and-after aerial views of Japan devastated by the tsunami that swept the region after the 9.0 magnitude earthquake. An interactive sliding scale allows the viewer to move across occupied areas prior to the when the deadly waves inundated the region and in the tsunami's wake. Click here to visit the ABC News (Australia) website. 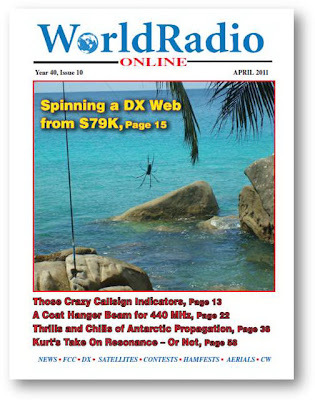 WorldRadio Online, the first online-only magazine devoted to amateur radio, is published monthly by CQ Communications, Inc., Hicksville, NY 11801. The Japan Amateur Radio League (JARL) is asking amateurs worldwide to keep 7.030 MHz and surrounding frequencies clear for disaster communications in the aftermath of the earthquake and tsunami that struck northeastern Japan a week ago today. In a statement on its website, JARL says its headquarters station, JA1RL, is maintaining contact with stations in the affected area to help with disaster relief efforts. It says the operation is mainly on 7.030 MHz and primarily between 2100 and 1100 UTC daily, but is asking hams to keep 7.030 clear around the clock until further notice. In other developments, Southgate Amateur Radio News is reporting that IARU Region 3 Secretary Ken Yamamoto, JA1CJP, says power is being gradually restored in less-damaged areas and that local radio amateurs are starting to establish stations at shelters. Most of these operations are on UHF repeaters. The president of Kenwood USA says the company's staff in Japan is safe and facilities there are undamaged. In addition, says Junji Kobayashi in a statement posted on the company's website (www.kenwoodusa.com), there has been no impact on Kenwood's equipment production since its main factories are located in Malaysia. Kobayashi said Kenwood's corporate offices are south and west of the quake zone, but "power outages and interruption of mass transit have kept most of Kenwood's staff at home since the earthquake." However, he says, "we expect the infrastructure to improve in the coming week and our operations to fully resume accordingly." "We appreciate the concern for our employees expressed by all those who have contacted us," Kobayashi added. He promised additional updates as conditions warrant. ICOM America says the company's facilities in Japan suffered only minor damage from the March 11 earthquake, but that there may be interruptions in its supply chain from vendors in the quake/tsunami zone and that other issues, such as rolling power blackouts, may slow production. Ray Novak, N9JA, ICOM America's Division Manager for Amateur and Receiver Products, released a statement reporting that no one on the company staff is known to have been injured as a result of the earthquakes or tsunami. "There are no damages reported at Icom's headquarters in Osaka or at either of our two main factories in Wakayama," the statement says. 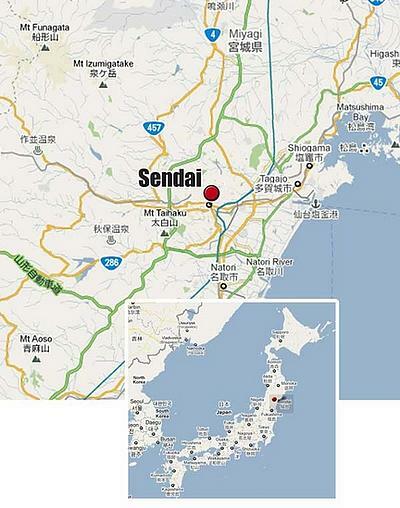 "Both Osaka and Wakayama are located far south of the most severely affected areas. Icom did suffer some minor damage at our Tokyo and Sendai branch offices." "Most of Icom's facilities and systems are ready to get back to normal business," the statement continued. "However, supplier logistics, commuting issues and future power disruptions will affect our company. It is too soon to tell how big an impact the earthquake and its aftermath will have on Icom." The statement concluded with a request for donations to help with disaster relief efforts: "We are fortunate that most of the Icom family has so far survived this crisis intact. Other families have not been so fortunate, and many lives have been lost. Crisis relief donations are requested through the American Red Cross at www.redcross.org. Google has also posted a helpful crisis response page on how to get involved." Check the CQ Newsroom page regularly for updates on the disaster in Japan, especially as it relates to amateur radio. Some production of Yaesu amateur radio equipment continues, according to Dennis Motschenbacher, K7BV, Executive Vice President of Yaesu Amateur Radio Sales. 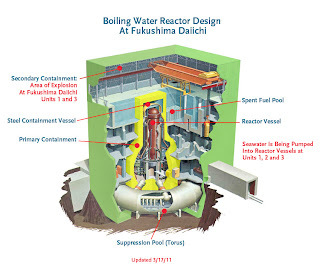 Yesterday, company president Jun Hasegawa announced that production at Vertex-Standard's factory in Fukushima, Japan, has been suspended due to earthquake damage. However, Dennis informs us that Yaesu also has a plant in China that is in full production. Operators Peter PJ4NX, Johan PA3FPQ, Jurgen PE1LWT and René PE1L will be active from the island of Bonaire (SA-006, WLOTA L1279) as PJ4X on 144 MHz moonbounce between April 7-11th. The locator is FK52ud. It was announced this past weekend (by popular demand), the PJ4X team will also be setting up a horizon-only 6 meter EME operation from PJ4-land for the first time ever. PJ4X will be operating on both moonrise and moonset when their moon is below 20 degrees elevation providing them with ground gain lobes. Experienced 6 meter EME operators know that these ground gain lobes can make your horizon-only antenna perform like a four-yagi array. QSL via PE1L. Click here and here for more details and updates. also be active as PJ2/PE1L from Curacao (SA-099, WLOTA LH-0942) between April 14-18th. Activity will also be on 144 MHz moonbounce only. The locator is FK52nc. CURACAO: Click here for more details and updates. Production of Yaesu radios at Vertex Standard's factory in Fukushima, Japan, has been temporarily halted due to earthquake damage. All Vertex Standard employees and their families are said to be safe. In an open letter to the amateur radio community, Vertex Standard CEO and President Jun Hasegawa expressed his gratitude for the many "kind words and thoughts about us during this difficult time." He reports that all Vertex Standard employees and their families are OK, although the company has not been able to reach its many dealers and subcontractors located near the coast. "We just hope that they are alive," he writes. Hasegawa also reports that the Yaesu factory in Fukushima suffered "minimal" damage from the earthquake but has been temporarily shut down nonetheless. He says he expects it to be back in normal operation within one to two weeks and asks for everyone's understanding and cooperation. At this time, there have been no public reports received from any of the other Japanese amateur radio manufacturers. At the request of Central Emergency Communication Committee, Ken Yamamoto, JA1CJP, the IARU Regional 3 Secretary, said the JARL is operating its HQ station JA1RL in Tokyo, and regional HQ stations. Following the earthquake in Japan, the International Space Station Amateur Radio Station Digipeater has been operational on 145.825 MHz to handle APRS traffic in the disaster area. A power outage has affected the Pacific side of some of the northeast region (JA7) of Japan. This has meant APRS mobile activity in this area such as the Wakayama Red Cross JA3FRI-12 cannot be seen. We have advised Toyo san that ARISS APRS digipeater can be used over Japan for this purpose. Any APRS operators in the affected area can switch to ISS digipeater by simply changing frequency to 145.825. ISS is coming over Japan about six times a day in the afternoon. The terrestrial path VIA WIDE?-? should work fine. But is better to change path to VIA ARISS so that the packets will be marked as having been digipeated by RS0ISS-4 each time. We hope the astronauts can be sure to keep APRS digipeater operating over Japan on 145.825. We hope that stations NOT in the disaster area monitor the ISS downlink for emergency traffic and can IGATE the downlink into the APRS Internet System. We as amateur radio operators are gathering and exchanging emergency information on the following frequencies. Please kindly keep these frequencies clear. The Japan Amateur Radio League (JARL) Regional HQ station JA7RL is now involved in emergency communication to support rescue and disaster relief coordination using 7 MHz SSB, 144 MHz SSB/FM and 430 MHz SSB/FM. Click here to hear JA1DOT on the air from Japan. - 7.043 MHz is being used by JR3QHQ, the Osaka branch manager of JARL, gathering incident information on radio and forwarding it to the Internet. - 7.075 MHz is occasionally operated by JL3YSP in Wakayama. - 7.030 MHz is the JARL emergency communication frequency in its bandplan and is in use by JA7RL (JARL regional HQ station). 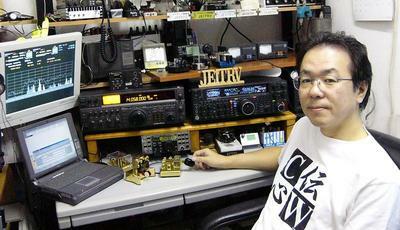 Japan Amateur Radio League (JARL) Secretary Ken Yamamoto, JA1CJP, said the efforts being made are purely voluntary. No organized emergency communication has been arranged. Caught up in the drama was IARU Regional 3 Chairman Michael Owen, VK3KI, who had earlier attended an IARU conference. He’s safe and well, and hopeful of being on a flight home. 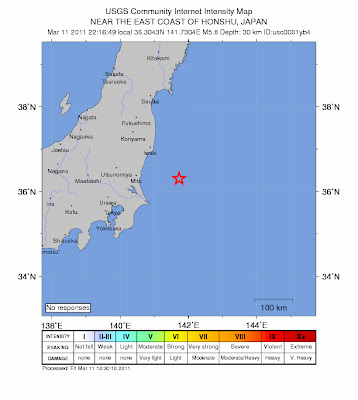 Emergency communications nets related to the earthquake centered near Sendai, Japan and resultant tsunami affecting the Pacific Rim are the Salvation Army Team Emergency Radio Network - SATERN - in operation on 14.265 MHz SSB and Oregon ARES/RACES on 3.964 MHz SSB. At this time, there are no reports of amateur radio involvement in the disaster response. Even so, IARU Region 1 Emergency Communications Coordinator Greg Mossop, GØDUB, has asked that extra care be taken so as to not interfere with any emergency traffic. The IARU Region III Emergency Center of Activity frequencies are 3.600, 7.110, 14.300, 18.160 and 21.360 MHz. Other suggested emergency frequencies being reported by amateur radio operators from Japan include 7.130, 14.230 and 21.230 MHz. 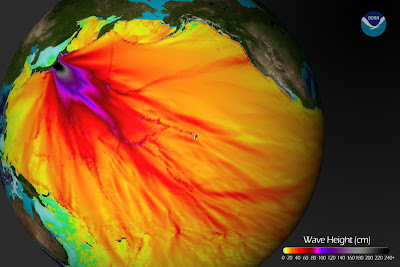 NOAA has generated several graphics of the Pacific tsunami and general tsunami information. They are available at the following websites. 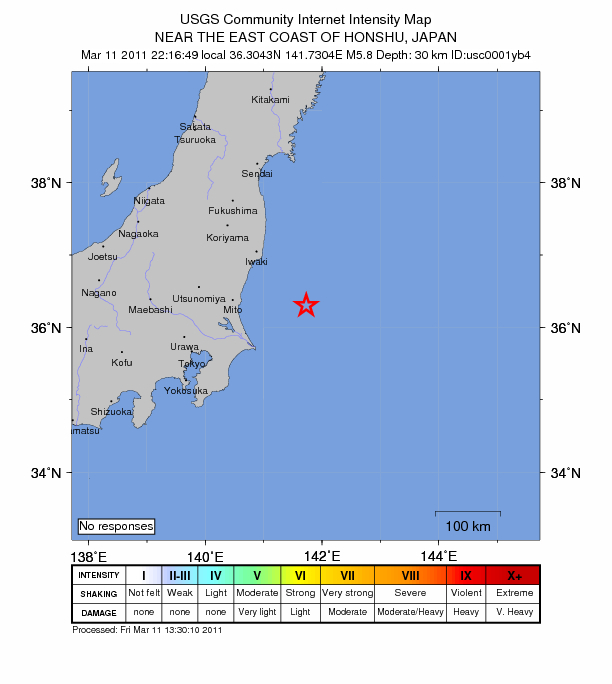 The magnitude 8.9 earthquake that struck off the coast of Japan is expected to be among the most powerful in recorded history, according to published reports, with multiple casualties and widespread destruction. "From the JARL headquarters, the newly appointed secretary Ken Yamamoto, JA1CJP, reports that the building shook quite strongly, but no serious damage was caused. 'With regard to amateur radio activity in the affected areas, we are not aware of any so far,' JA1CJP said. 'It seems that the communications infrastructure has survived the quake and is in working order in regard to priority communications.' He is making inquiries wider afield to determine JARL involvement. The sunspots are back and so is the DX! Saturday's sunspot number hit 143, the highest since 2005! Ten and 15 meters were hopping over the weekend, due to a combination of improved propagation and contest activity. Check out the CQ Facebook page and CQ Propagation Editor NW7US's website at <http://prop.hfradio.org/> to stay up to date on the latest info. Plus, learn the science behind the sunspots in CQ magazine. Now turn off the computer and turn on that long-neglected HF ham rig! The ionosphere is hot and so are the ham bands! The sun yesterday, March 7, as seen by the SOHO satellite. Photo courtesy ESAC.